After dying a little on the inside from our UBC sushi crawl, Vancity Noms and I decided to take things a little easier for our next sushi adventure. 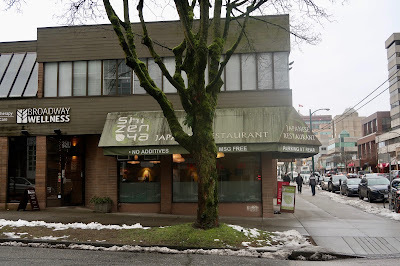 That took us to Shizen Ya, a small restaurant chain with two locations in Vancouver, where we planned to have a light lunch. Shizen Ya is the Whole Foods of the sushi restaurant world. 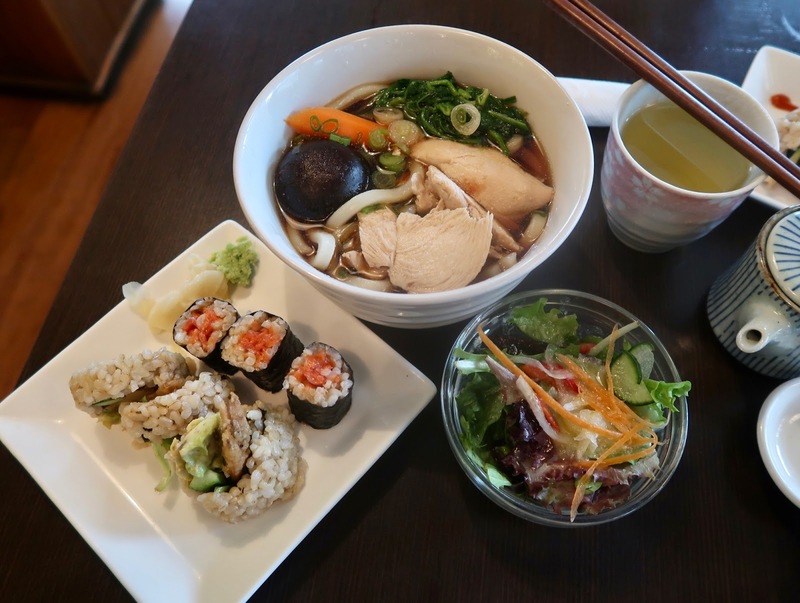 Everything about the restaurant screams healthy and organic. 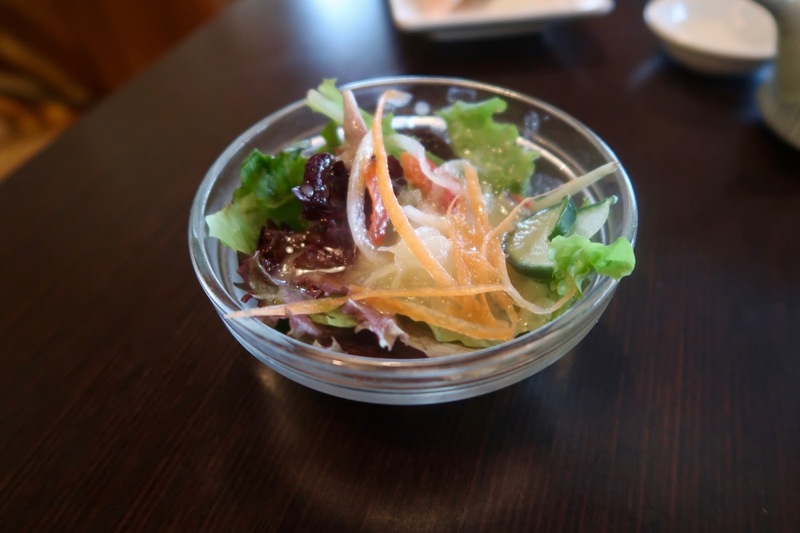 There is a large vegetarian menu, as well as many gluten-free options. 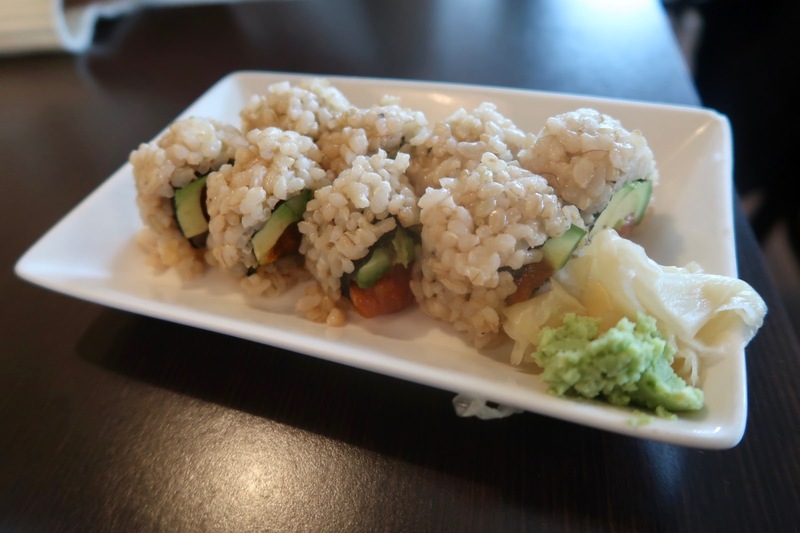 Their food contains no additives in addition to being MSG-free, and they use organic brown rice for all of their sushi. They also make the prices high just to give you that real Whole Foods experience. Since Vancity Noms is an avid fan of Whole Foods, this was the perfect sushi restaurant for her. Our "light" lunch quickly turned into a feast in which our table was completely jam-packed with food. I couldn't resist getting the Chicken Udon & Sushi Combo, which was only $10.95, but I also wanted to try loads of other stuff. I ended up having to balance plates and menus on my legs in order to clear the table barely enough for some food photography. Unfortunately, this is a regular occurrence with me. I never thought I would like brown rice in my sushi, but Shizen Ya managed to make it work. The chopped sockeye salmon was super soft and created a nice, creamy texture. The seaweed was also easy to chew. The Dynamite Roll came with creamy avocado and juicy tempura prawn. The batter on the prawn was slightly hard, but the flavours worked well together. 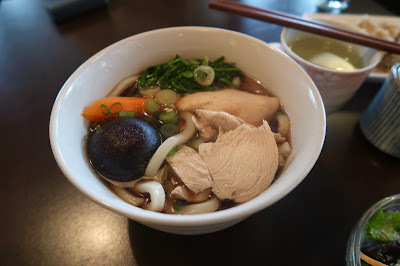 The main filler of the combo, the Chicken Breast Udon Noodle Soup, came with white chicken meat and thick udon noodles. The broth was on the richer side, while the udon noodles tasted like standard fare. I thought it could have been tastier had they lightly grilled the chicken. 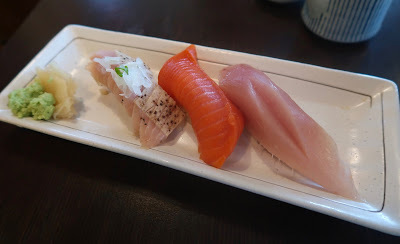 After the Sushi & Udon combo, I had three pieces of nigiri that really blew my expectations. The Toro Tataki Nigiri was only seared very slightly, but had an extremely soft, melty texture. The texture was also perfect with the Wild Sockeye Salmon Nigiri. 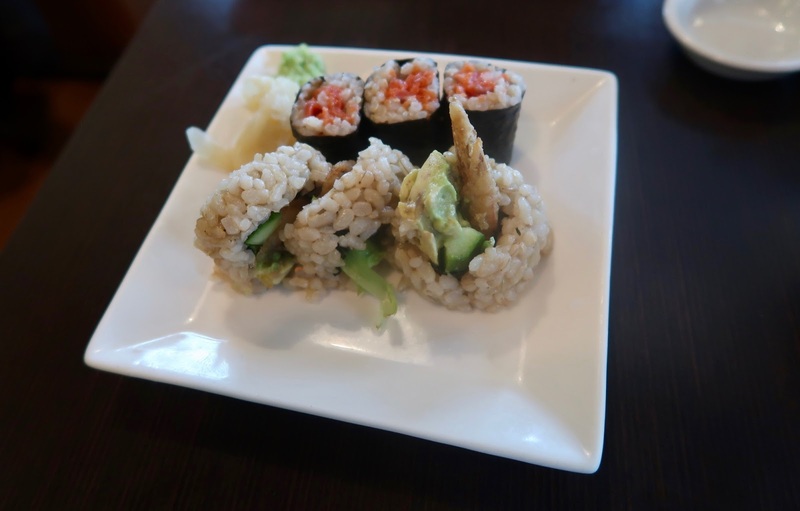 The Albacore Tuna Nigiri came with a thick slice of extremely fresh tuna, and the organic brown rice was packed just loosely enough to complement the soft, delicate textures of the fish. 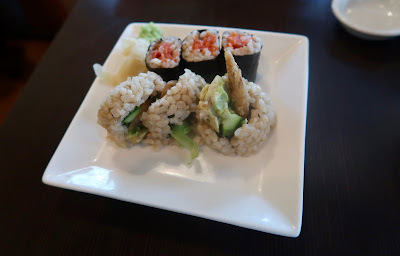 Next up, the Spicy Salmon Roll came with the same soft and fresh sockeye salmon and a decent helping of creamy avocado. The spicy sauce was used conservatively and did not overwhelm any of the ingredients in the roll. 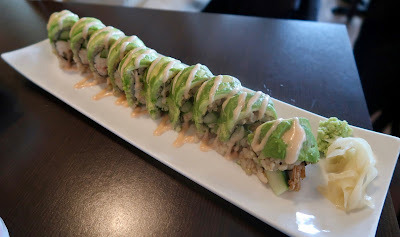 Finally, just to blow up my stomach size a few more notches, I went for the Natural Bomber Roll, which consisted of tiger prawn "whole wheat" tempura, fresh real crab, mayonnaise, cucumber, organic spring mix lettuce, organic avocado, and creamy bomber sauce. The crab meat was pleasantly soft and tasted somewhat like the Brunswick canned sardines I regularly eat as 4 a.m. snacks. The prawn tempura was a little hard, but the abundance of fresh, tasty avocado and the richness of the mayonnaise-based creamy bomber sauce made up for it. You spilling soy sauce on the menu HAHA...remember? Well, I think we can conclude that I really can't function before 3 p.m.!